Join Our Newsletter Email List! And coming at a time when our political capital is so sore, so ugly, so meanly vengeful, sowing fear and chaos, what could be better. 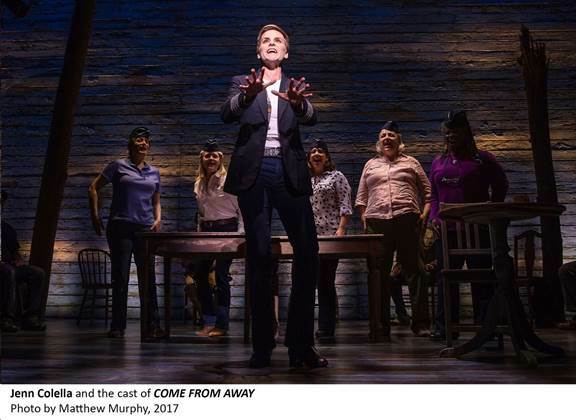 Come From Away, with a rousing, inspiring book, music and lyrics by Irene Sankoff and David Hein for a soaring concept by Michael Rubinoff is something of a miracle. We really are our better angels. We don’t have to let ourselves be driven into the dark. Way back in 2001, sixteen little years ago, the small town of Gander, Newfoundland, pop 10,000, was enjoying its quiet, late summer – it was September – when its huge sleepy airport, a relic of World War II refueling stops, thrummed into massive activity. Instead of the usual two or three planes daily, thirty-eight jumbo jets full of 7,000 home bound passengers were ordered to land there. It was September eleventh. U.S. air space was closed to all traffic. Not a single plane of the hundreds aimed at the United States was allowed until it was vetted. But the passengers trapped in Gander knew nothing. What happened? Why were they there? Then, when the awful news blackening the day trickled through, panic and pandemonium raced through the crowded passengers, still bound in their planes. And all of the blessed people of Gander turned out to help. These poor folks were going to be here who knows how long and they were going to need – oh – everything. Sheets, and pillows, -- and soap and water, and showers and tooth brushes and lots of toilets. And lots of toilet paper. And who is going to clean up those toilets to keep them from getting clogged, but first, get them out of the planes and into people’s houses and into shelter and food lots of food , and oh my goodness, there were animals in the holds of those planes, gotta take care of them animals. And a pregnant monkey! (she’s peachy keen in all the other roles she plays, too) and she pulls a dilly of a show stopper. And oh so wonderful Chad Kimball playing Kevin, the stabler half of a gay couple, carrying all of us away with “Prayer”. He plays several lightning change other characters, too. 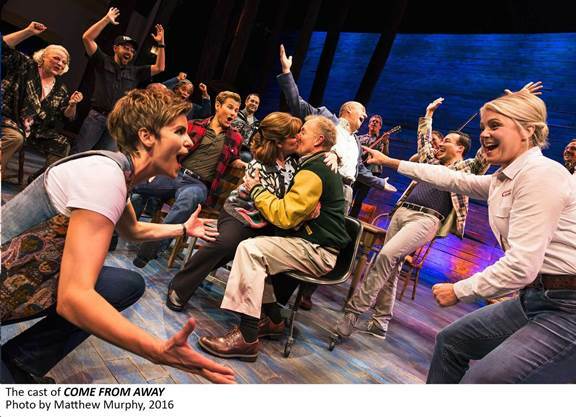 The other half of the gay couple, the other Kevin (terrific Caesar Samayoa) ( even better as Muslim chef Ali) seems to boom out in every song. The whole Sankoff/Hein score in Ian Eisendrath’s musical arrangements is so thoroughly a part of what is happening under director Ashley’s interweaving skills that everything is wonderfully inspiringly inseparable, Beowulf Boritt’s down home setting with its soaring trees, Toni-Leslie James’s ingeniously, cleverly simple, absolutely apt, inventively changeable costumes, Howelll Binkley’s wisely warm lighting, Gareth Owen’s rich sound design, all, all of it one. The way we ought to be, I kept thinking. The way we could be. The way we were. Americans who cared. Just exactly like these Canadians who cared. Every single member of the cast is just bliss. Petrina Bromley (Bonnie and others) Gino Carr, (Oz and others). I loved the new lovers, Diane (Sharon Wheatley) and Nick (Lee MacDougall), got carried away by Q. Smith as Hannah, ”I’m Here”. Perfect pitch Kendra Kassebaum, best of all, hugely warm Astrid Van Wieren as Beulah who seemed to be everywhere, helping, helping, helping. When you are on your feet, applauding, and cheering, here’s a tip: just keep on applauding as the smashing good band comes back and gives you a little impromptu concert that’ll make you dance all the way up the aisles. What a show. It makes you feel good about yourself. It makes you feel hopeful. Personal note: My birthday is September 11. I have not celebrated on that day ever since that terrible day. I think I will again. What a show. DO NOT MISS IT. 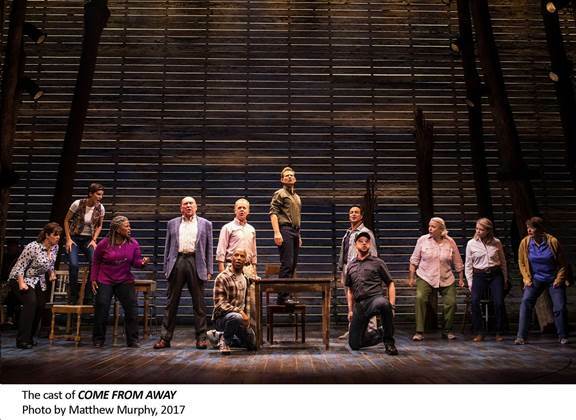 Come From Away. At the Schoenfeld Theatre, 236 West 45th Street. Tickets: $47-$167, Also premium. $38 rush. 1hr, 40 min. Open run.